An embryo (Greek: ἔμβρυον, plural ἔμβρυα) is a multicellular eukaryote organism in its early stages of development. In humans and most mammals, an embryo is carried in the mother's womb, while in vertebrates such as birds, the immature organism develops within the confines of an egg. 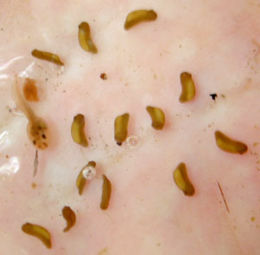 For seed plants, an embryo develops inside a seed, prior to germination. All living beings go through stages of development, requiring the passage of time. The embryo is one part of the formation stage for the development of an organism. It comes on the foundation of the fertilization of gametes and prepares the ground work for the next stage, the fetus of a human, for example, or, in the case of a plant, seedling. Embryology is the study of the development of an embryo. The exact time period generally corresponding to the embryonic stage is imprecisely defined. In a broad sense of the term, an organism is an embryo between the time of fertilization and the time that it is anatomically and physiologically complete (fully developed) and able to survive as a separate organism. However, some use the term embryo not just as an early stage of development, but as the organism at any time before birth, hatching, or germination, even if structurally complete. However, in humans, the term embryo is reserved for the developing organism from conception and implantation until the first seven or eight weeks, after which it is called a fetus until birth. At eight weeks, the human being is not fully developed nor able to survive as a separate organism. In general, for vertebrates, the term embryo may correspond variously to any time prior to birth or hatching, or until it is a distinctly recognized form with structural resemblance to the adult animal, or until it is considered a fetus (a developing stage in mammals and viviparous vertebrates between embryo and birth). Nonetheless, even birth or hatching are not ultimate limits, since marsupial newborns are immature and are raised after birth in a pouch, corresponding to the pre-birth, late developmental stages of a placental mammal. Some animals, such as butterflies, undergo complete metamorphosis, with the final adult stage distinctly different in form from the newly hatched larva. In organisms that reproduce sexually, once a sperm fertilizes an egg cell, the result is a cell called the zygote, which contains DNA of the two parents. In plants, animals, and some protists, the zygote will begin to divide by mitosis to produce a multicellular organism. The result of this process is an embryo. In animals, the development of the zygote into an embryo proceeds through the specific, recognizable stages of blastula, gastrula, and organogenesis. The blastula stage typically features a fluid-filled cavity, the blastocoel, surrounded by a sphere or sheet of cells called blastomeres. During the stage of gastrulation, a stage prior to formation of separate organs, cells of the blastula undergo coordinated processes of cell division, invasion, and/or migration to form two (diploblastic) or three (triploblastic) tissue layers. In triploblastic organisms, the three germ layers are called endoderm, ectoderm, and mesoderm. However, the position and arrangement of the germ layers are highly species-specific, depending on the type of embryo produced. In vertebrates, a special population of embryonic cells called the neural crest has been proposed as a "fourth germ layer," and is thought to have been an important novelty in the development of head structures. During organogenesis, following gastrulation, molecular and cellular interactions between germ layers, combined with the cells' developmental potential or competence to respond, prompt the further differentiation of organ-specific cell types. For example, in neurogenesis, a subpopulation of ectoderm cells is set aside to become the brain, spinal cord and peripheral nerves. Modern developmental biology is extensively probing the molecular basis for every type of organogenesis, including angiogenesis (formation of blood vessels), chondrogenesis (cartilage), myogenesis (muscle), osteogenesis (bone), and many others. Generally, if a structure pre-dates another structure in evolutionary terms, then it often appears earlier than the other in an embryo; this general observation is sometimes summarized by the phrase "ontogeny recapitulates phylogeny" (Gould 1977). For example, the backbone is a common structure among all vertebrates such as fish, reptiles, and mammals, and the backbone also appears as one of the earliest structures laid out in all vertebrate embryos. The cerebrum in humans, which is the most sophisticated part of the brain, develops last. This rule is not absolute, but it is recognized as being partly applicable to development of the human embryo. The embryo of a placental mammal may be defined as the organism that exists once the zygote divides (thus becoming a fertilized ovum), until it becomes a fetus. A fetus (or foetus, or fœtus) is a developing mammal after the embryonic stage and before birth. In humans, the embryo is defined as the organism from the time of implantation in the uterus until about the eighth week, while the fetus is the stage from this time until birth. In botany, a seed plant embryo is part of a seed, consisting of precursor tissues for the leaves, stem, and root. Once the embryo begins to germinate—grow out from the seed—it is called a seedling. Plants that do not produce seeds, but do produce an embryo, include the bryophytes and ferns. In these plants, the embryo is a young plant that grows attached to a parental gametophyte. Week 1-4 5-7 days after fertilization, the blastula attaches to the wall of the uterus (endometrium). When it comes into contact with the endometrium and implants itself there, the connections between the mother and the embryo will begin to form, including the umbilical cord. 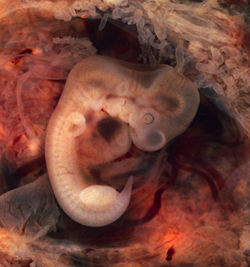 The embryo's growth centers around an axis, which will become the spine and spinal cord. Week 5-6 Chemicals produced by the embryo stop the woman's menstrual cycle. Neurogenesis is underway, showing brain wave activity at about the 6th week. The heart will begin to beat around the same time. Limb buds appear where the arms and legs will grow later. Organogenesis begins. The head represents about one half of the embryo's axial length, and more than half of the embryo's mass. Week 7-8 The embryo's blood type becomes apparent. Myogenesis and neurogenesis have progressed to where the embryo is capable of motion, and the eyes begin to form. Organogenesis and growth continue. At the end of the 8th week, the embryonic stage is over, and the fetal stage begins. Gould, Stephen Jay. 1977. Ontogeny and Phylogeny. Cambridge, Mass: Belknap Press of Harvard University Press. ISBN 0674639405. Harrison, R.G. 1969. Organization and Development of the Embryo. New Haven, Yale University Press. ISBN 0300011555. Stern, C. D. 2004. Gastrulation: From Cells to Embryo. Cold Spring Harbor, NY: Cold Spring Harbor Laboratory Press. ISBN 0879697075. Chart of human fetal development. The Visible Embryo from fertilization to birth. This page was last modified on 8 September 2017, at 16:43.